Can you believe it's April already! 2013 is already a quarter over! Time just flies! With the new month comes Farley's legendary Currently! I look forward to this every month and yet it creeps up on me each time! Listening - Revenge is my Sunday night guilty pleasure. The show just flies by each week because it is so good. I just cannot get enough of this show! Do you all watch too? If not you better jump on the Revenge bandwagon because it's a great show! Loving - Oh.My.Goodness! I did the entire dessert table today and holy cuteness! Pinterest has completely revolutionized holiday celebrations! I can't wait to show the pictures with you all but for now I am keeping them a secret! You will just have to come back and see later this week! Thinking - See previous category... When you are in charge of the dessert table, you go overboard and want to eat everything in sight! Let's just say I might have eaten one too many homemade Cadbury eggs! Wanting - Can't every other week be Spring break? Wouldn't that be the life! Going on a full month of school with no days off for April is not looking like fun! Needing - I have been staying up until 1-2 am for the past 3 nights in preparation for the two parties we had this weekend. Waking up early has not been easy. I need to sleep in and go to bed early for the next few days in hopes of catching up or I will be getting sick! Advice - My advice is to just stay at blogging for your own enjoyment and self satisfaction. Don't get too caught up in the numbers game of how many followers you have. If you do, you lose focus of why you started blogging in the first place! I am also going to be linking up with Jessica at Literacy Spark for her first ever linky party. The rules are really simple! 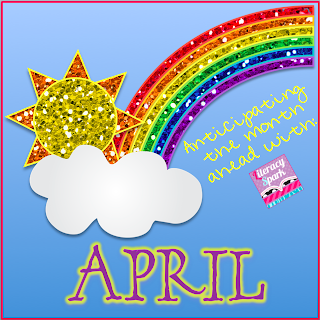 -Share one thing you are looking forward to during the month of April. -Share one thing you are dreading during the month of April. -Share one thing that you hope to accomplish during the month of April. I am really looking forward to finding out my cooperating teacher and placement for student teaching! It is really becoming a reality that I will be starting student teaching next month! I cannot wait! I am dreading the fact that there are NO days off in April! Having only one full week of school in March was such a tease! Now I am so used to all these days off it is going to be one looooong month of April! I hope to accomplish the task of organizing my closet in April. Right now it is literally floor to ceiling stuffed with piles of things that I have bought for the classroom for past holidays, books, singing stuffed animals, games, and more. I need to really get it organized so I can find where everything is for student teaching! It is going to be a huge task but I am determined to get it done! What are you looking forward to or dreading in April? Link up to share! I also ate waaay too much today. I wish I had an excuse! I watch Revenge Monday mornings when I get ready for school. We watch Walking Dead on Sunday nights. Thanks for linking up! How long do you do student teaching for? Just a month or two instead of an entire semester? (I was just thinking about the school year being almost over...) Or maybe you are talking about during the fall? Anyways, I keep seeing this reminder about there being no days off in April. I am in the same boat! !